Acne is a common skin disease that is associated with changes in hormonal levels that affect not only teenagers, but also many adults, particularly women. Acne is caused when pores in the skin become clogged with sebum (oil). A surge in hormones during adolescence and the years before menopause often creates an increase in oil production. The cause of acne is a bacterium called P. acnes. When oxygen is not present, this bacterium grows very quickly as a result of the body not sloughing off cells at a normal rate. This slow cell turn over allows pores to become clogged with oil. The more oil production, the more pores become clogged with a layer of dead skin cells plugging the top of the pore. P. acnes bacteria multiplies and creates a pimple or cyst. Successful acne treatments vary from individual to individual. Topical and/or oral medications are used to treat acne. If oral antibiotics are prescribed to kill and control bacteria, lab work is monitored every three months to insure the body is functioning within normal range. Topical medications exfoliate the skin to increase cell turnover and introduce oxygen into pores to prohibit bacteria growth. To complement the use of medications, your provider might suggest acne treatments or chemical peel to extract blackheads and pimples which will exfoliate dead skin cells to open pores. Early, effective treatment of moderate to severe acne can prevent permanent scarring. Dry skin is a problem for many individuals. Most patients require eczema treatment with a combination of over the counter products in conjunction with prescription medications. Dry skin can be a result of environment, climate, or contact with everyday household and skin care products. Your provider can assist identifying the cause of your dry skin and present an eczema treatment plan with options for care. Folliculitis is inflammation of hair follicles that can occur on any part of the body that has hair. Most common areas are backs, bottoms, and legs. Folliculitis looks like red pimples stemming from a hair follicle. It may be caused by bacteria, yeast, or fungus. Shaving or clothes rubbing on the skin can irritate the follicles and lead to folliculitis. Sweat and make-up can block pores creating more irritation of the follicles. When follicles become injured, infection can follow. Infected follicles may contain pus and can itch or burn. Often times, mild folliculitis clears up within two weeks without treatment. If the condition worsens or spreads, antibiotics are used. Laser hair removal is recommended for persistent irritation as laser hair reduction can create a decrease in this condition. The most common types of fungal skin infections are athlete’s foot, jock itch, ringworm and toe nail fungus (Onychomycosis). Symptoms of fungal infections are often quite annoying and the organism that causes them is easily spread from person to person. Treatments include the use of oral and topical medications. If oral medications are prescribed, regular lab work is monitored to insure the body is functioning within normal ranges. There are various hair loss disorders. Hair loss in men is almost always a result of genetics along with aging. For some, hair loss can be associated with medical conditions such as anemia and thyroid disorders. In women, it can happen at any time as a result of hormonal changes associated with aging. The loss of hair can also follow childbirth, crash dieting, surgery, or a traumatic emotional event. A treatment plan will include topical and oral medications, as well as injectable steroids. Herpes is any inflammatory skin disease marked by the formation of small red vesicles in clusters. Herpes Zoster (Shingles) is caused by the return of the chicken pox virus and occurs mostly in the elderly and can be prevented with a vaccination. It begins as a painful sensation soon followed by a red blistering rash on one side of the body. Treatment with anti-viral drugs within 48 hours of onset decreases the severe pain at the site of eruption. Herpes Simplex 1, often referred to as cold sores is an outbreak of vesicles on the lips and around the nose. Herpes Simplex 2 is primarily transmitted sexually and usually presents in the genital area. Treatment with anti-viral oral and topical medications can be given to prevent and manage outbreaks. For some people, excessive sweating can be embarrassing and uncomfortable. Excessive sweating is a medical condition called hyperhidrosis that affects millions of people every day. There are several treatment options including topical prescriptions and Botox injections, to considerably reduce symptoms of this condition. Hyperpigmentation is often a result of over-exposure to the sun, which results in dark spots. Melasma, a hormonal condition, presents as patches of brown pigmentation. Treatments for both conditions are usually the same, using topical medications to lighten the discoloration in conjunction with chemical peels. IPL photo facials will effectively reduce hyperpigmentation when performed in a series. Normal moles are common small brown spots or growths on the skin that appear in the first few decades of life in almost everyone. They can be either flat or elevated and are generally round and regularly shaped. Many are caused by sun exposure. Melanoma is one of the deadliest forms of skin cancer. It most often appears as an asymmetrical, irregularly bordered, multicolored or tan/brown spot or growth that continues to increase in size over time. It may begin as a flat spot and become more elevated. In rare instances, it may not be pigmented. Dysplastic Nevi (atypical moles) are unusual benign moles that may resemble melanoma. People who have atypical moles are at increased risk of developing single or multiple melanomas. The higher the number of these moles someone has, the higher the risk; those who have 10 or more have 12 times the risk of developing melanoma compared to the general population. Dysplastic nevi are found significantly more often in melanoma patients than in the general population. Medical reports indicate that about 2 to 8 percent of the Caucasian population has dysplastic nevi moles. Heredity appears to play a part in the formation. Those who have dyspastic nevi plus a family history of melanoma (two or more close blood relatives with the disease) have an extremely high risk of developing melanoma. Individuals who have dysplastic nevi, but no family history of melanoma, still face a 7 to 27 times higher risk of developing melanoma compared to the general population, which is a great enough risk to warrant monthly self-examination, regular professional skin exams and daily sun protection. This is the most common type of skin cancer. It most often appears in areas of the body that get a lot of sun exposure. BCC often grow slowly and may look like a reddish patch of dry skin, flesh colored (or pink, red, or brown) pearl-shaped lump, a pimple that won’t heal, sore that bleeds, heals, and then returns, scars that feel waxy, or a flat or sunken growth. Removal of BCC is usually preformed within our clinic unless larger re-excisions are necessary which is then referred to a plastic surgeon. This is a very common type of skin cancer. It often appears on areas of the body that get a lot of sun exposure. SCC usually has a reddish color, scaly or crusty hard bump, patch, or pearl shaped, can be an open sore that itches or bleeds, or a scaly patch on the lip. Without treatment, SCC can grow deep and spread to other parts of the body. SCC can be deadly, so early treatment is a must. A biopsy is performed in our office and the provider will assess what further treatment is necessary based on each individual case. If a mole appears irregular to the dermatologist, a biopsy of the mole will be taken to be examined by a derma pathologist. It is important to catch skin cancer in its early stages in order to fight it properly. 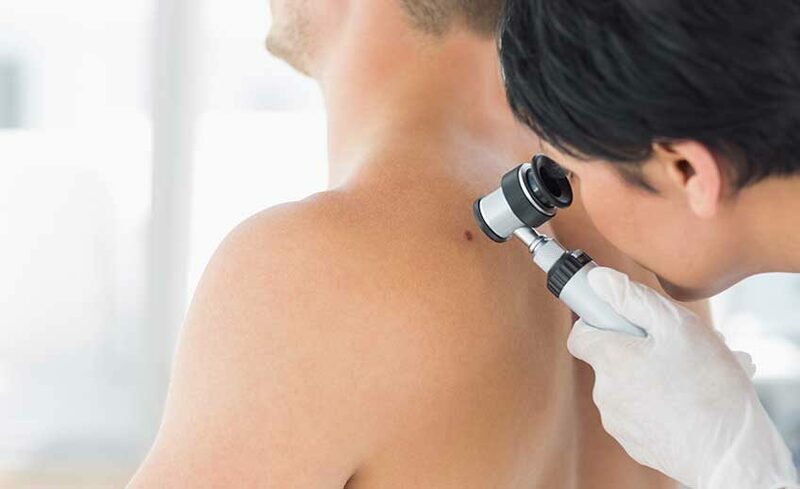 Once the pathology results come back determining whether the mole is cancerous or pre-cancerous, our dermatologist will perform a simple, in-office mole removal procedure. Psoriasis is a chronic and hereditary condition marked by vivid red macules, papules, or plaques covered with silvery scales that can cause itching, burning, or soreness. Severity of the condition can range from a few spots of dandruff-like scaling to major flare-ups that cover large areas. Psoriasis treatment involves topical or oral medications as well as injectable medications known as biologics, ie Humira and Stelara. Rosacea is a chronic skin disease that causes redness and swelling, primarily on the face. If left untreated, this condition becomes worse over time and progresses to a persistent facial redness, pimples, and broken blood vessels. The condition is aggravated by certain triggers such as alcohol, foods, caffeine, climates and more. Identifying and avoiding your triggers will improve the symptoms of rosacea. Several treatment options are available including medications used both topically and/or orally to reduce symptoms of this condition. Gentle chemical peels are used to improve the texture of the skin by exfoliating dead skin cells allowing skin to breathe and absorb products better. Laser therapy can reduce facial redness as well as diminish the appearance of broken blood vessels. These common crusty spots may look flat and smooth at first, but usually become thicker or scaly and can often be confused with a cancerous lesion. A dermatologist may choose to biopsy the growth to confirm whether it is benign. Treatment options include cryotherapy (freezing with Liquid Nitrogen), curetting (scraping) off the lesion, and also topical creams to exfoliate and help the lesion slough off. Tinea versicolor is a disease in which the normal yeast that lives on the skin overgrows. It is uncertain why this occurs to some people and not others. Tinea versicolor presents as a lighter than normal spot with darker borders. The spots can appear anywhere on the body with a scaly texture and can be itchy. People of all skin color can develop this disease; but more often develops in teens and young adults because they have more oily skin. People who live in tropical or subtropical areas are more likely than those who live in colder climates to get this disease. Treatments include cleansers, topical medications, and anti-fungal oral medications. Warts can vary in appearance ranging from a single or cluster of cauliflower like growths or flat bumps. They are a virus that can be spread to other parts of the body or other people passed by skin to skin contact. Early treatment is best using various methods such as cryotherapy (freezing with Liquid Nitrogen) or topical medications. Warts can be persistent and multiple treatments may be necessary.